Gasification is most simply thought of as choked combustion or incomplete combustion. It is burning solid fuels like wood or coal without enough air to complete combustion, so the output gas still has combustion potential. The unburned gas is then piped away to burn elsewhere as needed. Gas produced by this method goes by a variety of names: wood gas, syngas, producer gas, town gas, generator gas, and others. It’s sometimes also called biogas, though biogas more typically refers to gas produced via microbes in anaerobic digestion. In the context of biomass gasification using air-aspirated gasifiers, the term producer gas is the term we will be using, since the other terms have implications that do not necessarily apply to the gas produced by our gasifiers. 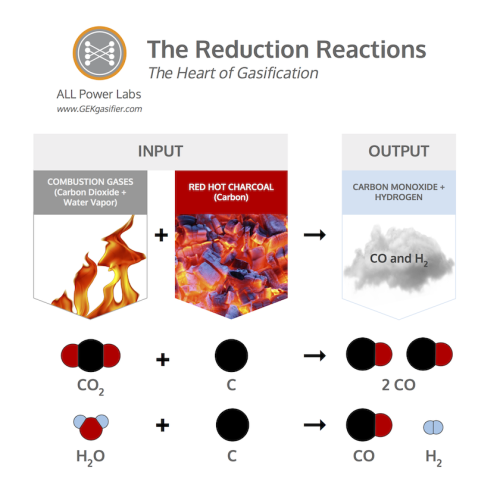 How we get there: the Five Processes of Gasification. Now let’s complicate things slightly. True gasification is a bit more than just the choked combustion summary presented above. It is more accurately understood as staged combustion. It is a series of distinct thermal events put together so as to purpose convert solid organic matter into specific hydrocarbon gases as output. Simple incomplete combustion is a dirty mess. The goal in gasification is to take control of the discrete thermal processes usually mixed together in combustion, and reorganize them towards desired end products. In digital terms, “Gasification is the operating system of fire”. Once you understand its underlying code, you can pull fire apart and reassemble it to your will, as well as a stunning variety of end products and processes. Gasification is made up for five discrete thermal processes: Drying, Pyrolysis, Combustion, Cracking, and Reduction. All of these processes are naturally present in the flame you see burning off a match, though they mix in a manner that renders them invisible to eyes not yet initiated into the mysteries of gasification. Gasification is merely the technology to pull apart and isolate these separate processes, so that we might interrupt the “fire” and pipe the resulting gases elsewhere. 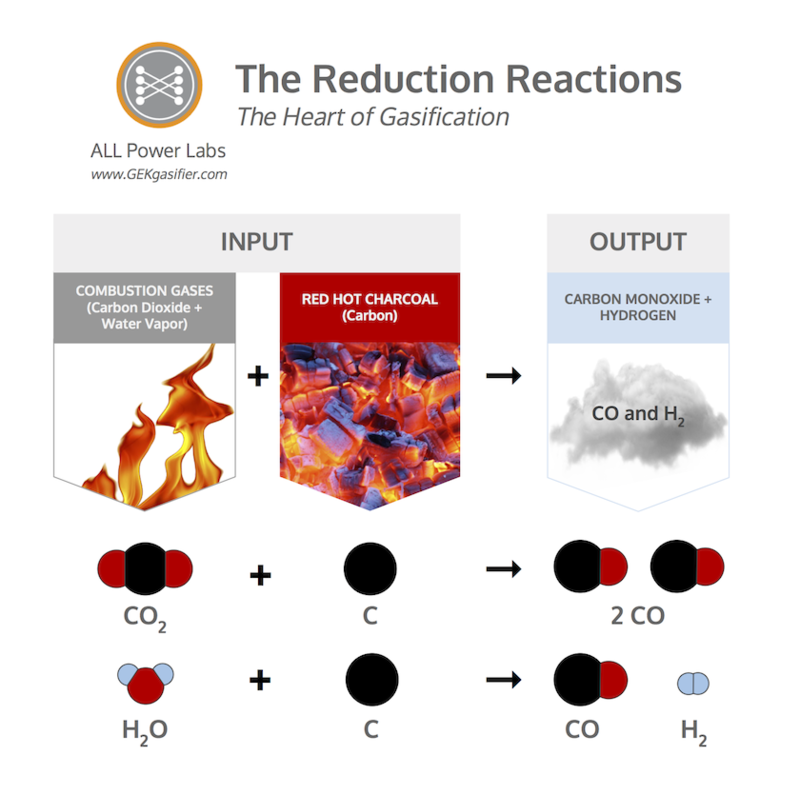 Three of these processes tend to confuse all newcomers to gasification. Once you understand these three processes, all the others pieces fall in place quickly. These three non-obvious processes are Pyrolysis, Cracking, and Reduction. Here’s the quick cheat sheet. Pyrolysis is the application of heat to raw biomass, in an absence of air, so as to break it down into charcoal and various tar gasses and liquids. It is essentially the process of charring. Biomass begins to rapidly decompose with heat once its temperature rises above around 240°C. The biomass breaks down into a combination of solids, liquids and gasses. The solids that remain we commonly call charcoal. The gasses and liquids that are released we collectively call tars. The gasses and liquids produced during lower temp pyrolysis are simply fragments of the original biomass that break off with heat. These fragments are the more complicated H, C and O molecules in the biomass that we collectively refer to as volatiles. As the name suggests, volatiles are reactive. Or more accurately, they are less strongly bonded in the biomass than the fixed carbon, which is the direct C to C bonds. The input to gasification is some form of solid carbonaceous material— typically biomass or coal. All organic carbonaceous material is made up of carbon (C), hydrogen (H), an oxygen (O) atoms– though in a dizzying variety of molecular forms. The goal in gasification is to break down this wide variety of forms into the simple fuel gasses of H2 and CO— hydrogen and carbon monoxide. Both hydrogen and carbon monoxide are burnable fuel gasses. We do not usually think of carbon monoxide as a fuel gas, but it actually has very good combustion characteristics (despite its poor characteristics when interacting with human hemoglobin). 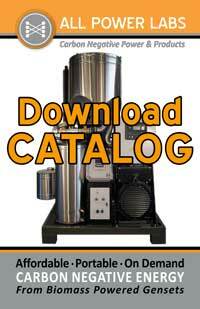 Carbon monoxide and hydrogen have about the same energy density by volume. Both are very clean burning as they only need to take on one oxygen atom, in one simple step, to arrive at the proper end states of combustion, CO2 and H2O. This is why an engine run on producer gas can have such clean emissions. 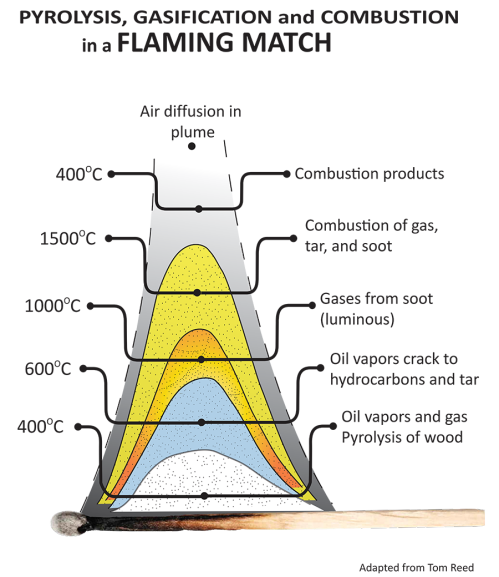 The engine becomes the “afterburner” for the more dirty and difficult early stages of combustion that now are handled in the gasifier. 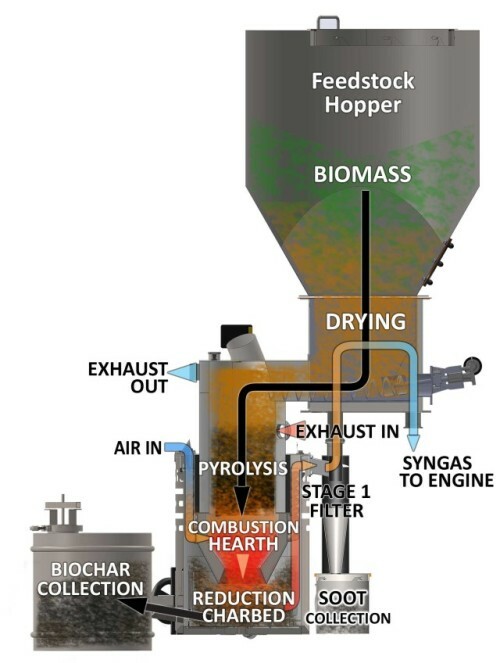 Thus in review, pyrolysis is the application of heat to biomass in the absence of air/oxygen. The volatiles in the biomass are evaporated off as tar gases, and the fixed carbon-to-carbon chains are what remains— otherwise known as charcoal. Cracking is the process of breaking down large complex molecules such as tar into lighter gases by exposure to heat. This process is crucial for the production of clean gas that is compatible with an internal combustion engine because tar gases condense into sticky tar that will rapidly foul the valves of an engine. Cracking is also necessary to ensure proper combustion because complete combustion only occurs when combustible gases thoroughly mix with oxygen. In the course of combustion, the high temperatures produced decompose the large tar molecules that pass through the combustion zone. Reduction is the process of stripping oxygen atoms off combustion products of hydrocarbon (HC) molecules, so as to return the molecules to forms that can burn again. Reduction is the direct reverse process of combustion. Combustion is the combination of combustible gases with oxygen to release heat, producing water vapor and carbon dioxide as waste products. Reduction is the removal of oxygen from these waste products at high temperature to produce combustable gases. Combustion and Reduction are equal and opposite reactions. In fact, in most burning environments, they are both operating simultaneously, in some form of dynamic equilibrium, with repeated movement back and forth between the two processes. Reduction in a gasifier is accomplished by passing carbon dioxide (CO2) or water vapor (H2O) across a bed of red hot charcoal (C). The carbon in the hot charcoal is highly reactive with oxygen; it has such a high oxygen affinity that it strips the oxygen off water vapor and carbon dioxide, and redistributes it to as many single bond sites as possible. The oxygen is more attracted to the bond site on the C than to itself, thus no free oxygen can survive in its usual diatomic O2 form. All available oxygen will bond to available C sites as individual O until all the oxygen is gone. When all the available oxygen is redistributed as single atoms, reduction stops. Through this process, CO2 is reduced by carbon to produce two CO molecules, and H2O is reduced by carbon to produce H2 and CO. Both H2 and CO are combustable fuel gases, and those fuel gasses can then be piped off to do desired work elsewhere. 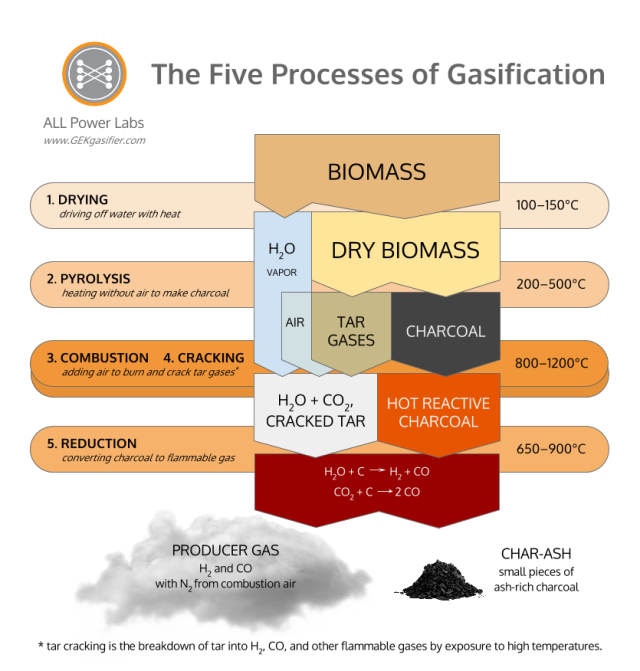 These are the most easily understood of the Five Processes of Gasification. They do what we think by common understanding, though now they do it in the service of Pyrolysis and Reduction. Combustion is the only net exothermic process of the Five Processes of Gasification; ultimately, all of the heat that drives drying, pyrolysis, and reduction comes either directly from combustion, or is recovered indirectly from combustion by heat exchange processes in a gasifier. Combustion can be fueled by either the tar gasses or char from Pyrolysis. Different reactor types use one or the other or both. In a downdraft gasifier, we are trying to burn the tar gasses from pyrolysis to generate heat to run reduction, as well as the CO2 and H2O to reduce in reduction. The goal in combustion in a downdraft is to get good mixing and high temps so that all the tars are either burned or cracked, and thus will not be present in the outgoing gas. The char bed and reduction contribute a relatively little to the conversion of messy tars to useful fuel gasses. Solving the tar problem is mostly an issue of tar cracking in the combustion zone. Drying is what removes the moisture in the biomass before it enters Pyrolysis. All the moisture needs to be (or will be) removed from the fuel before any above 100°C processes happen. All of the water in the biomass will get vaporized out of the fuel at some point in the higher temp processes. Where and how this happens is one of the major issues that has to be solved for successful gasification. High moisture content fuel, and/or poor handling of the moisture internally, is one of the most common reasons for failure to produce clean gas. More simply you might just think of gasification as burning a match, but interrupting the process by piping off the clear gas you see right above the match, not letting it mix with oxygen and complete combustion. Or you might think of it as running your car engine extremely rich, creating enough heat to break apart the raw fuel, but without enough oxygen to complete combustion, thus sending burnable gasses out the exhaust. This is how a hot rodder gets flames out the exhaust pipes.